"A Not So Silent Night," the eighth album from Eugene Marlow's Heritage Ensemble, is a potpourri of traditional Chanukah and Christmas melodies performed in various jazz and Afro-Caribbean styles. Eugene Marlow’s Heritage Ensemble “A Not So Silent Night” album (2016) has earned four stars in the December 2017 issue of Downbeat Magazine. It’s featured in Frank-John Hadley’s “Stellar Stocking Stuffers” article, p. 87. 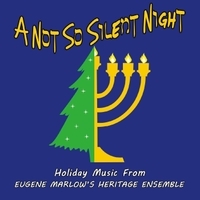 "Eugene Marlow’s Heritage Ensemble recognized the stale orthodoxy of much holiday music and chose to do something about it on A Not So Silent Night (MEII Enterprises; 37:44 ****). The Hanukkah, Noel and New Year’s songs derive a good part of their ecumenical chutzpah from the inventiveness of Marlow’s arrangements and the spry individuality of his pianism. It’s a blessing that the ensemble approaches “Dreidel, Dreidel, Dreidel”, “Jingle Bells,” and the rest with the right mix of audacity and familiarity."